This first in a new monthly series, it’s time for the August 2016 IPSY Glam Bag Review and un-boxing! Or should I say, un-bagging. These little bags are one of my favorite aspects of this service. As a little disclaimer, not all products in the IPSY bags may be vegan, but this month…they just happened to be! 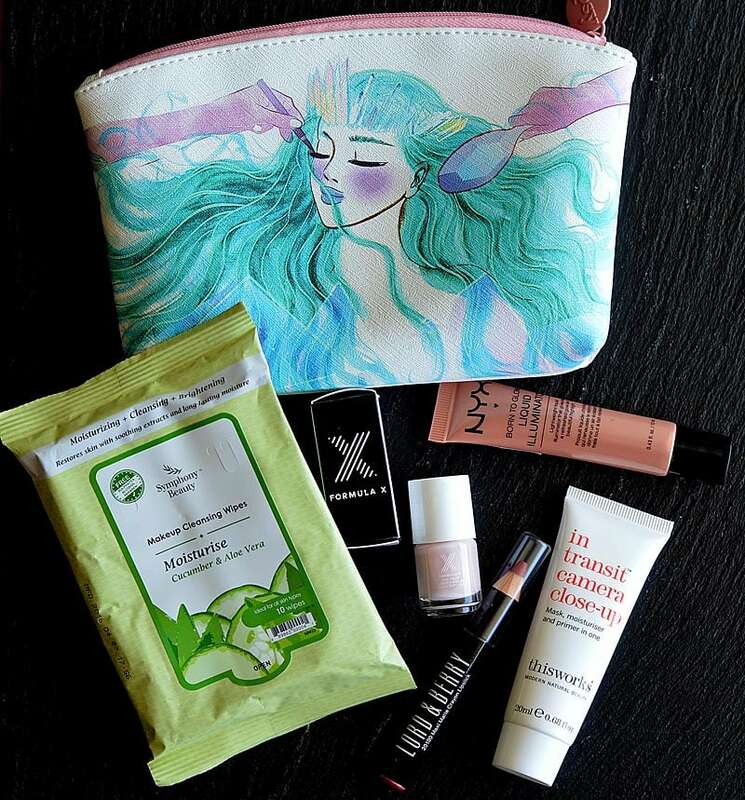 If you are unfamiliar with Ipsy, they are a monthly subscription service offering beauty bags, just like this one. 5 beauty products are delivered to your door each month for $10 with free shipping. When you sign up, you are asked a series of questions such as your skin tone which help the folks at IPSY to customize your bag. Additionally, instead of a box, these beauty products come in a different little bag each month. They are perfect to reuse for everyday or even travel. The bags contain a range of products from skin care to high-end cosmetics. It’s the easiest way I know to learn about and experience products you may never have heard of before committing to purchase their full-size counterparts. For me, it’s all about getting that surprise each month in the mail. I am a subscription addict! The bag retails for just $10 (with free shipping in the U.S.). You can learn more about IPSY here, but first … let’s get into the review! Symphony Beauty Makeup Cleansing Wipes – These gentle facial wipes instantly cleanse, removing makeup and oil while they nourish and hydrate. They also help unclog pores and clarify. Soothing extracts deliver long-lasting moisture. Sulfate-free. Alcohol-free. Paraben-free. Plus these little wipes smell A-M-A-Z-I-N-G! This Works In Transit Camera Close-Up – This mask-moisturizer-and-primer-in-one instantly preps your skin for photo-perfect makeup. Evens, plumps and brightens skin instantly! Lord & Berry 20100 Maximatte Crayon Lipstick in Intimacy – The subtle pink goes with absolutely everything. Our favorite shade for summer and fall. I love this lipstick and it’s incredibly moisturizing and softening on the lips. It has a matte finish that won’t dry out, so it’s long-lasting. FORMULA X Nailpolish in Dollface – This pretty baby pink is what I would call a neutral. This long-lasting formula is free of parabens, sulfates or phthalates. Enriched with ShineXcel™—a luminescent ingredient that amps up the shine. NYX Professional Makeup BORN TO GLOW LIQUID ILLUMINATOR in GLEAM – This lightweight formula blends into skin for a natural look. A radiant look with minimal coverage. It’s a pigmented golden peachy pearl shade that is perfect for summer! I really loved this bag and was pleasantly surprised that everything in it was vegan-friendly. As I mentioned above, this is not a vegan service per se, but I will detail which items aren’t as I proceed with these monthly reviews.